The dynamic experience of how women emerge their business remains our primary conversation here. Join us! We welcome one-time guest bloggers or even ongoing guest contributors. We invite women entrepreneurs and businesswomen to share their experience – on leadership, success, failure (and transcending it), marketing, social tech, talent retention, and more. Have a topic in mind that’s particularly important to you, that also could benefit women business owners. For more insight to the blog’s editorial mission, please read our first post: Victory, Defeat, and In Between: Welcome to the Women Grow Business Blog. Then draft a blog post between 400-600 words of original work (this means YOU must have written it, and it must not have been previously published) and submit to tinuwgb (at) asktinu (dot) com, along with your contact information, photo (see specs below), and mini bio (75 words, and please include a link to your business and contact information, e.g. Twitter handle) for consideration. To maintain preferred blog formatting, please provide link love in your post as well i.e. include 3-5 links related to your content, please (thank you!). Earn some social karma by linking to content other than your own, e.g. reliable news articles, reliable blogs or blog posts, etc. However, they can NOT be links directly to products, tracking links, Facebook pages, etc. Feel free to link to those in your bio at the end though. Please do not include photos in your post unless you have ownership of the intellectual property rights associated with that photo or the photo is an unambiguous part of the creative commons with proper attribution. What decisions have best enabled your company to endure the current economy (and excel)? What most influenced you to launch your business? What key strategic and operational tactics helped your business first get started? What failure or missed benchmark proved a good business lesson (and why)? Do you use social media for your business? How? If not, why not? Where do you envision your business in (5) years? You are welcome to add additional Q&As, the above is a guide to get you started. Please send replies to tinuwgb (at) asktinu (dot) com, along with your contact information, photo, and mini bio as above. Contact the editor: tinuwgb (at) asktinu (dot) com. 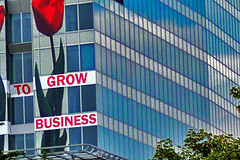 All that said… thanks for your interest in Women Grow Business!